This card was made by Cindy Peterson. 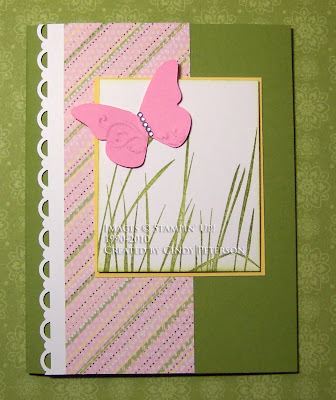 She used the Inspired By Nature stamp set for the grass. The butterfly was made with the Beautiful Wings embosslit. The bling on the butterfly comes from our Eggcellent Eggs kit. The scallop trim border is one of the free Sale-A-Bration items that you can earn when you place an order for $50 before the end of March. The designer paper is the Sweet Pea paper in the Occasions mini catalog. You'll see more paper from that collection in other cards that I'll be posting later this week. This is so beautiful! I love the way she used the little bling on the butterfuly body from the Eggcellent Eggs Kit!! Fantastic job Cindy. Now I know I need to get that set with the grass stamp. Love it!! !